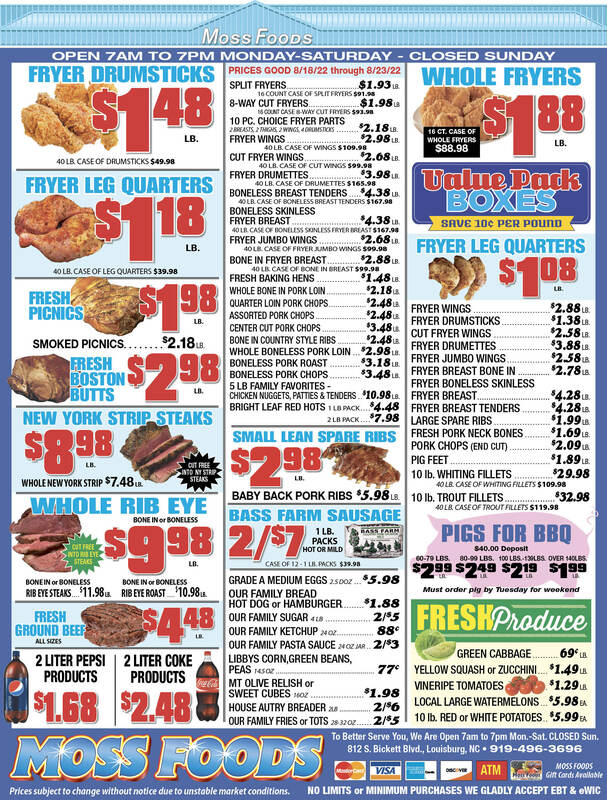 Showing 40 articles from February 26, 2014. FRANKLINTON — Police locked down two schools and swept through the community with dogs after a man robbed a downtown bank. 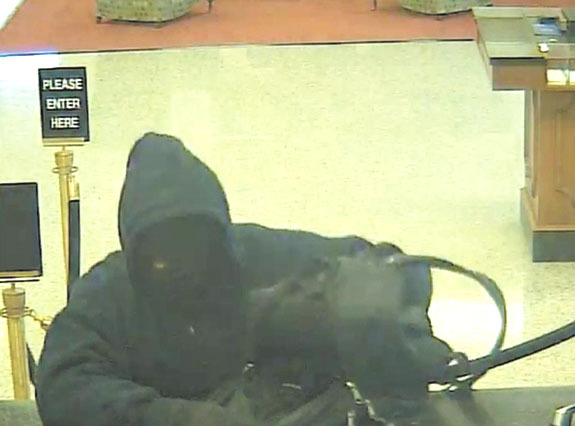 Franklinton Police Chief John Green Jr. said a suspect is alleged to have stolen an undisclosed amount of money from First Citizens Bank before fleeing the area on foot at about 11:40 a.m. on Wednesday. BUNN — Animal control arrested a man they allege cruelly treated dogs and allowed his 80 hogs and goats to roam — creating headaches for neighbors and motorists. Lin Chang was charged with allowing livestock to run at large and animal cruelty. Animal Control Director Taylor Bartholomew said officers had been working with Chang to quell the problem — getting an initial complaint in 2009 — but the situation never improved. 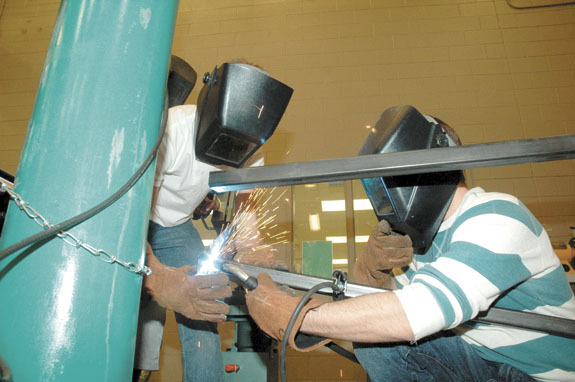 LOUISBURG — A nearly $500,000 grant will bolster workforce training classes in Franklin and surrounding counties. The Golden LEAF Foundation awarded a $460,000 grant to support a training partnership involving Vance-Granville Community College and the four public school systems in the college’s service area. The Manufacturing Skills Training Alliance is led by VGCC and also includes the Career and Technical Education high school programs from Frankin, Vance, Granville and Warren counties. LOUISBURG — Federal authorities are trying to determine what caused a single-engine sport plane to clip a power line and spark a grass fire. No injuries were sustained in the Feb. 23 incident, though. A report by Dep. C. Saunders alleges that residents in the 100 block of Thomas Jones Road — the Wood community — saw the plane make several passes over their property, flying lower and lower with each pass. YOUNGSVILLE — Commissioners approved documents outlining coaching guidelines and a code of ethics for parents. Parks and Recreation Director Pete Gibson said that since he took over the department in December, he’s wanted to put written policies in place that governs behavior. An incident with a parent in early February emphasized the need, he said. Frankly, I’m not sure if last week’s meeting on U.S. 401 improvements will do any real good, but it did take away one major excuse that we’ve heard from state officials in the past. Now, no one in the top echelon of the North Carolina Department of Transportation can say (truthfully, at least) that they didn’t know the highway is important to Franklin County and this county’s future prospects. It’s taken 17 years, but a new policy that will go into effect this fall should be good news for community college students in North Carolina. The policy should make it easier for students to transfer course credits to University of North Carolina system universities. Is a good teacher kinda like a work of art to the uncultured? By that, I mean, you sort of just know it when you see it. Or, is there this incredible matrix of instructional review, student grades and other factors that help determine just how good a teacher is? Listen: You may learn who not to vote for! During April, in the year 1607, history records voting was among the first things the Jamestown voyagers did when they set up English America’s first permanent settlement. From what I can tell, this appears to be when influence peddlers started the ball rolling with dirty politics in America. Captain John Smith, a true hero of Jamestown, was at first denied his seat on the Leadership Council due to suspicion and rumor he had concealed a mutiny during the voyage. 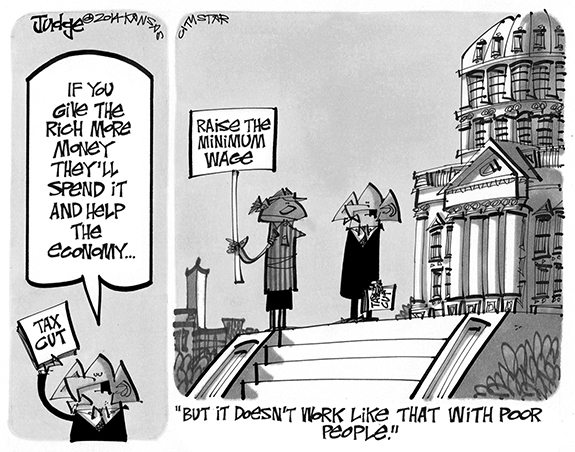 I haven’t been happy with the actions of the General Assembly in Raleigh for a few years now. 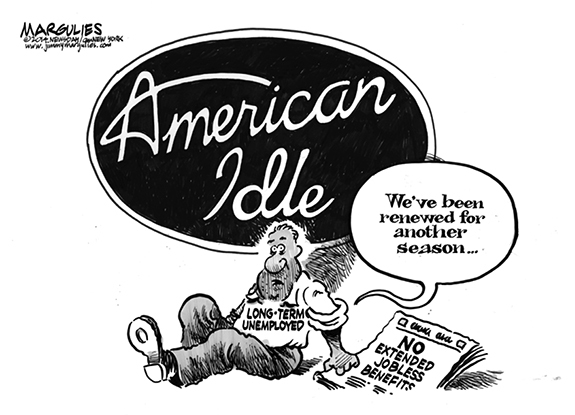 Considering that I’m a progressive Democrat, that should not come as a surprise. However, I’m one of those: It could always be worse guys. 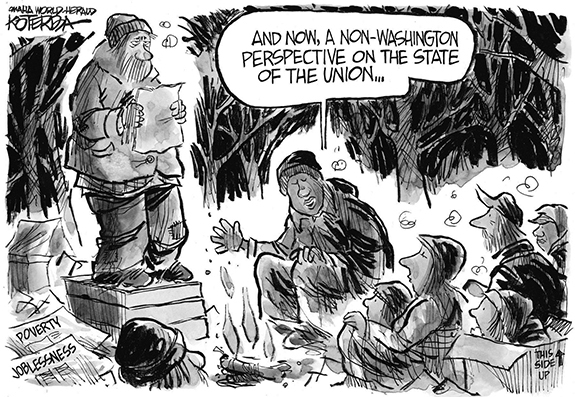 In 2011, I looked at the antics of Scott Walker in Wisconsin and said at least it’s not that bad in North Carolina. SLAP HAPPY. Louisburg College leadoff ace Emmylou Clark slaps a single during last week’s softball matchup against rival Surry Community College. LOUISBURG -- The opening of the 2014 softball season has featured a split of emotions -- literally -- for Louisburg College head coach Don Stopa. 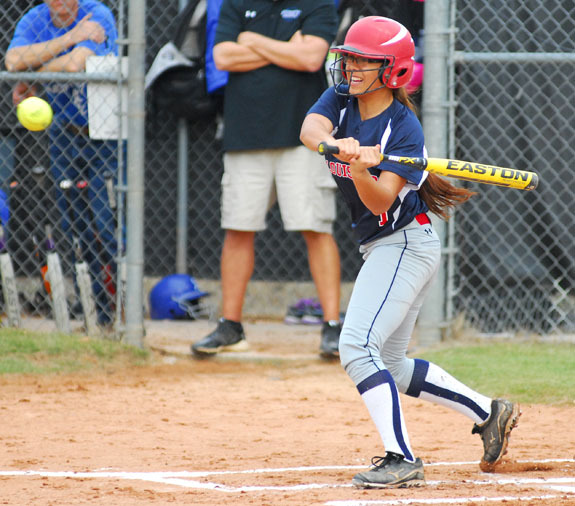 The Lady Hurricanes have played four doubleheaders to date -- and split each one of them. “We’ve blown three seven-inning leads so far,’’ Stopa said. “We just haven’t been able to get on the dirt and practice enough (because of poor weather). INTENSE AALIYAH. 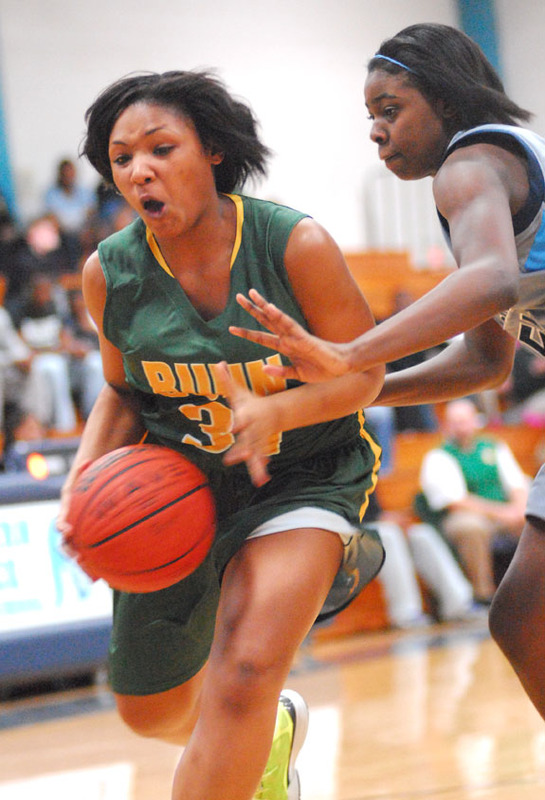 Bunn’s Aaliyah Simmons (with ball) drives during last Thursday night’s road basketbalfl setback against league foe Southern Vance. 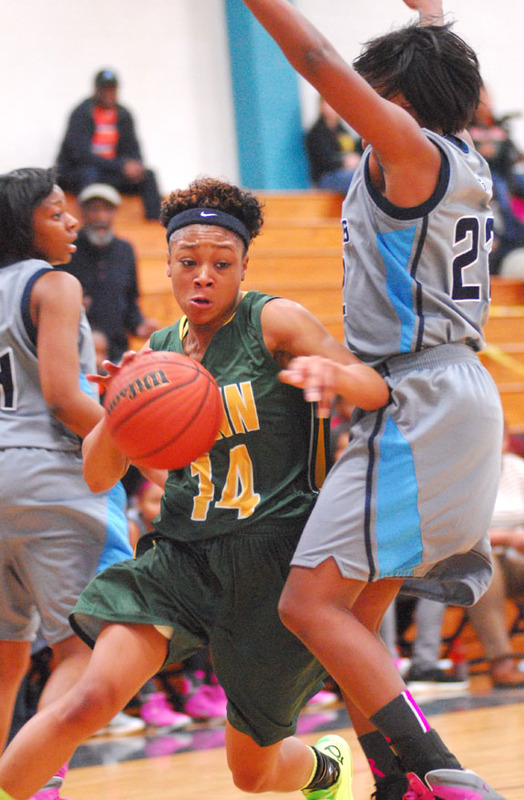 HENDERSON -- After a long season, the Bunn Ladycats ultimately came within two points of gaining a share of the Northern Carolina Conference basketball championship. But it wasn’t meant to be for BHS, which saw its four-year crown streak come to a close last Thursday with a heartbreaking loss at eventual title holder Southern Vance. ON THE RISE. 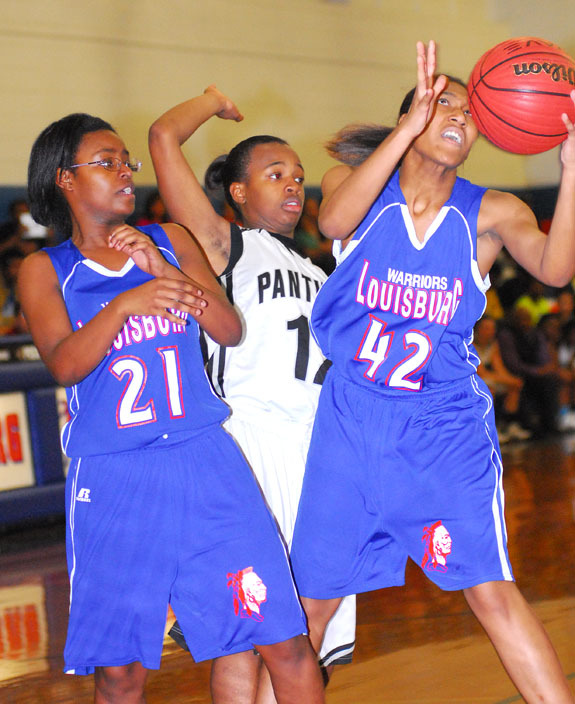 Louisburg’s Vanisha Wilshire elevates for a basket during last Wednesday’s tournament game with Granville Central HS. LOUISBURG -- Louisburg High School girls basketball coach Sarah Bolten thought her club’s season might be over when the Lady Warriors fell to eventual champion Granville Central during last Wednesday’s semifinals of the Tar-Roanoke Athletic Conference Tournament. But due to a third-place tie with Southeast Halifax, Louisburg played that squad in an important matinee’ meeting last Friday before the title games of the TRAC Tourney. DRAIN-O. Bunn’s Jordan Lucas nails a jumper last Thursday against Southern Vance in NCC hoops action. BUNN -- Bunn ended the regular season with a bang -- and began the Class 2-A Boys Basketball State Playoffs in the same fashion. BHS, which has won 22 of its last 23 outings, closed out the Northern Carolina Conference portion of its campaign last Friday night by drubbing Durham School of Arts by a tally of 88-32 at the Bunn Dome. LAYUP TIME. Louisburg High School guard Kenan Epps drives for a basket during the semifinals of the TRAC Boys Hoops Tournament. LOUISBURG -- Old-timers love to talk about the glory days of Louisburg High School boys basketball -- back when the gym was filled to the rafters with energetic fans. It’s been awhile since that level of intensity has been spotted at the LHS Gymnasium, but it was certainly there during last Friday night’s Tar-Roanoke Athletic Conference Championship. RED SPRINGS -- Franklinton couldn’t overcome an early deficit during the Red Rams’ loss to Red Springs on Monday in the opening round of the Class 2-A Boys Basketball State Playoffs. FHS trailed by over 20 points in the opening half as the Red Rams had difficulty with Red Springs’ tenacious pressure defensive schemes. BUNN -- Bunn High School was scheduled to open its 2014 softball season Wednesday at home versus the Northern Nash Lady Knights. LOUISBURG -- One of the by-products of Louisburg College’s recent men’s basketball dynasty is that there usually aren’t many hotly contested matchups at the Taylor Center. But LC head coach Mark Vanderslice expects to deviate from that norm Saturday when new rival Richard Bland College comes to town for the regular season finale for both clubs. LOUISBURG -- The Louisburg College baseball team completed a weekend sweep of the College of Southern Maryland with a pair of wins at Frazier Field on Sunday afternoon. Spencer Bivens earned a 6-3 win, out of the pen in game one as he came in for starter Deshaun Hewitt, who went two innings in the start. LOUISBURG -- The 19th-ranked Louisburg College Lady Canes had their hands full Monday night as they played their second night in a row and had to go to overtime to beat the Dolphins of Brunswick Community College, 96-87, in women’s basketball action the Taylor Center. The Canes were led by guards Kiara Rawls and Courtney Raiford as Rawls dropped 24 points in the conference win, while Raiford finished with 23. RICHMOND, VA. -- Daniel Concepcion struck out seven in 6.2 scoreless innings, while Logan Farrar drove in two runs lifting Virginia Commonwealth University to a 3-0 win over East Carolina Tuesday afternoon at The Diamond. With the win, the Rams improved to 7-1 while the Pirates dropped their fourth-straight game, falling to 3-5. Concepcion (2-0) scattered three hits in his second start of the season while walking three. 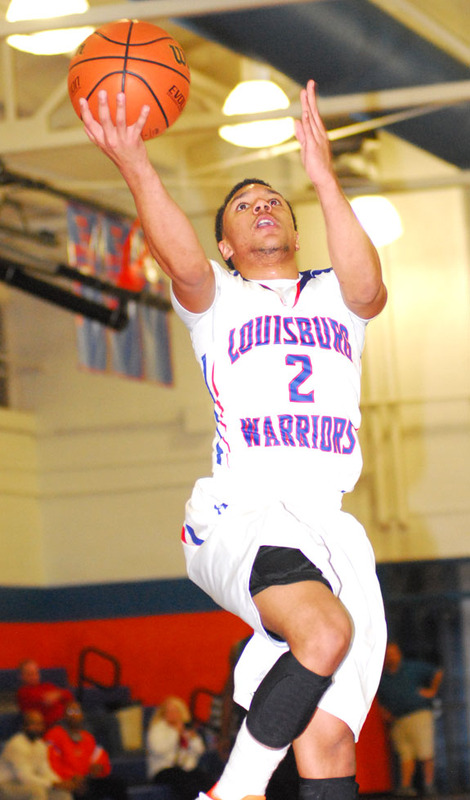 The Louisburg Warriors were outstanding during the 2013-14 boys basketball campaign. 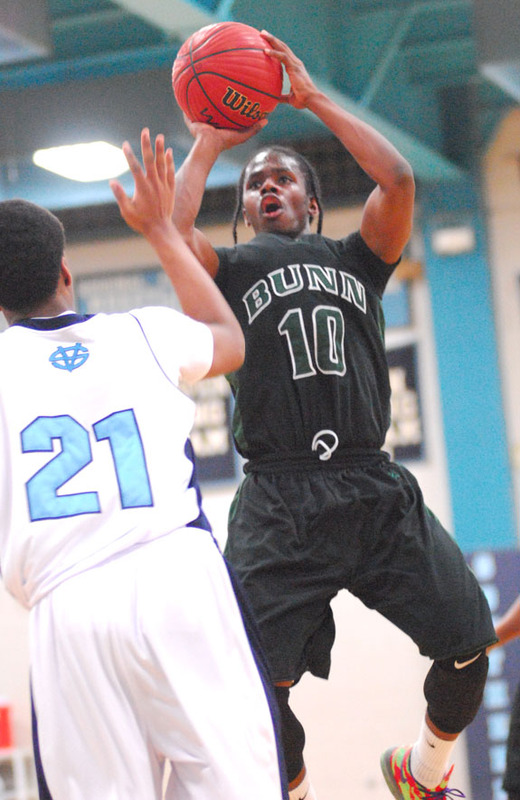 Bunn’s Malik Finley (with ball) soars for a deuce during last Thursday’s win at Southern Vance. 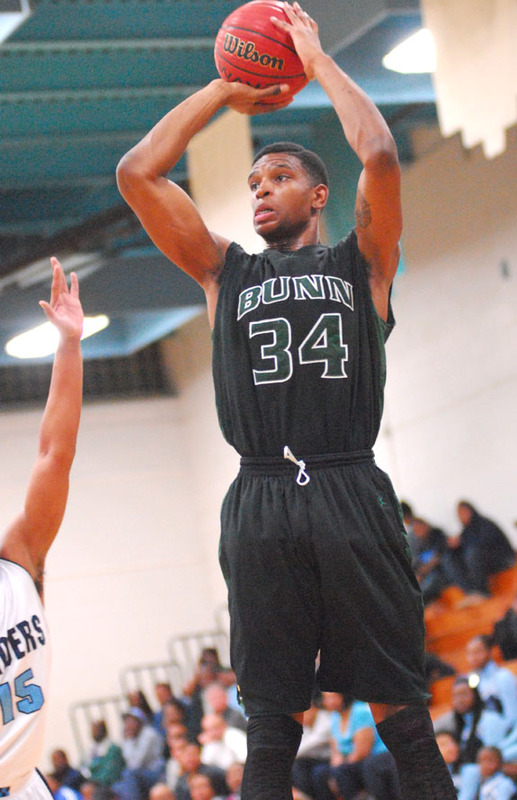 Bunn hosted Graham on Wednesday in the second round of the Class 2-A State Basketball Playoffs. Louisburg’s Keiana Evans (right) grabs a rebound as teammate Tyreka Kearney looks on last Wednesday night against conference foe Granville Central HS. 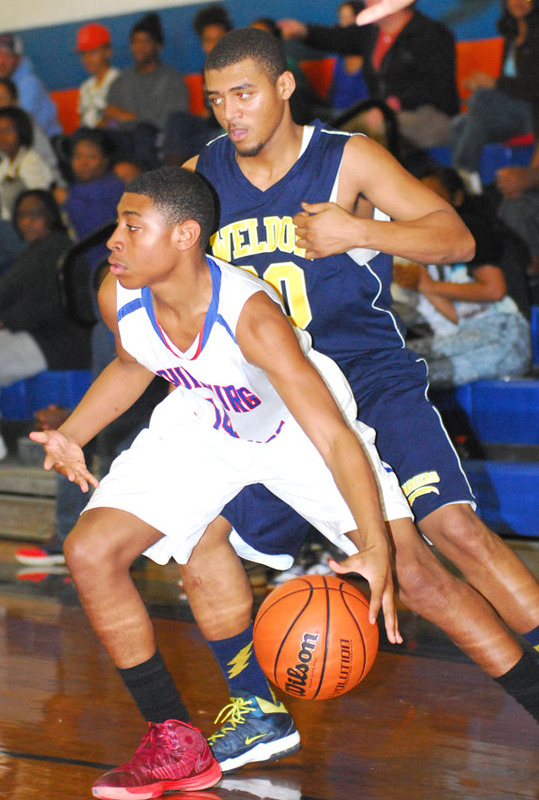 Louisburg High School’s Calvin Manley (with ball) escapes a Weldon defender last Friday night. 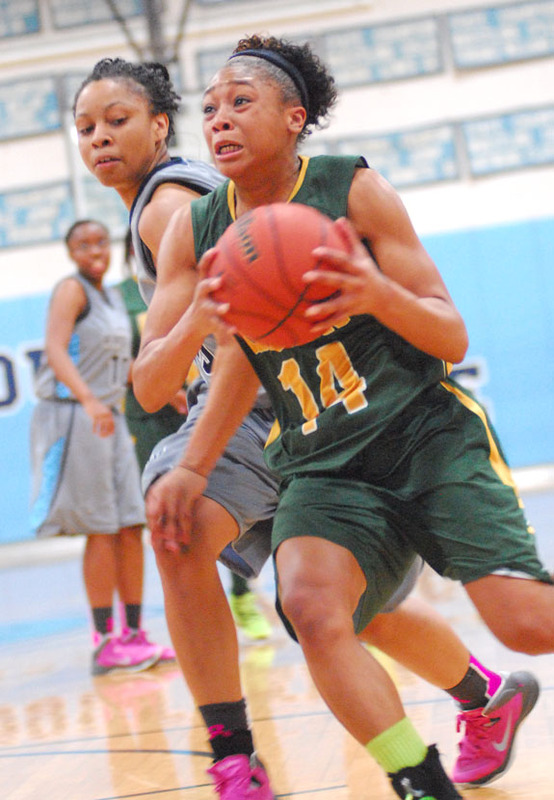 Junior standout Tainasha Vines (with ball) has put up some amazing statistics this season for the Bunn High School girls basketball team. Bunn’s Precious Walker (with ball) enjoyed an exceptional performance for the Ladycats during last Thursday’s game at Southern Vance. 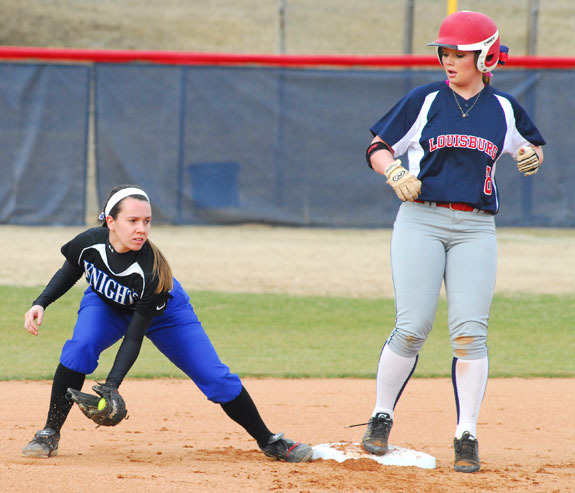 Louisburg College’s Tori Geissinger (right) makes her way to second base during last Thursday’s doubleheader with Surry CC at Sheilah R. Cotten Field on the LC campus. 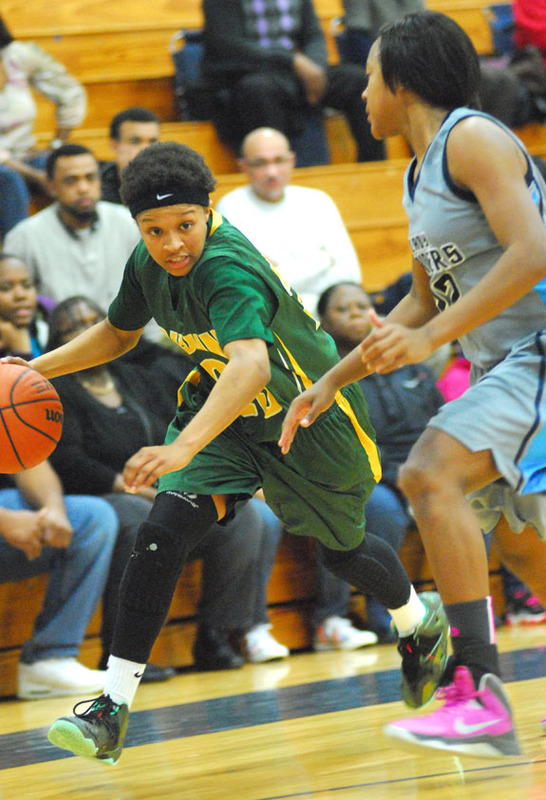 Bunn’s Tainasha Vines (left) drives for a basket last Thursday against rival Southern Vance. 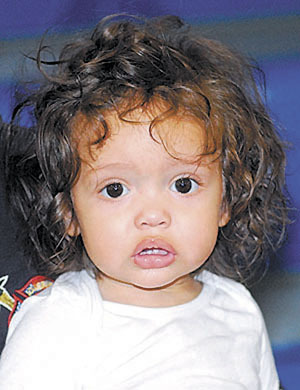 Do you remember the article from Nov. 11th, 2010, in The Franklin Times called “I Am Lost, Where Is Josh”? This article was about the big surprise that Louisburg Curves’ members received as actor Josh Halloway visited his family here in Louisburg; Josh and his three brothers paid a visit to his mother Jean Halloway and aunt Angela McNeely. 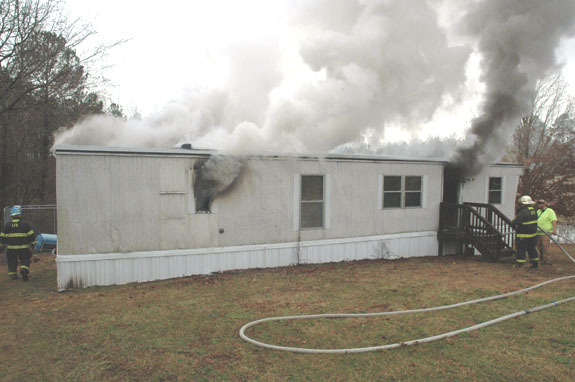 Three fire stations combined to extinguish a blaze that engulfed a mobile home north of Louisburg. The Louisburg Fire Department provided primary response to the blaze, reported to authorities at about 2 p.m. on Feb. 21. Firefighters responded to find fire and smoke shooting from the home on Gap Loop Road north of Louisburg off U.S. 401. Crews from Louisburg, Epsom and Gold Sand battled the blaze for about two hours. Franklin County sheriff’s deputies charged a man with assault after he tried to pass a knife attack off as horse play. According to a report, Dep. George Perry responded to a report of injuries being sustained by an employee at Brock Cabinets on Weathers Street near Youngsville. Omar Franicso Avendano-Toledo told authorities that he sustained cuts during an apparent assault in the warehouse the morning of Feb. 20. The filing period closes at noon Friday, but by press time on Wednesday, races in the spring and fall were already firming up. As of Wednesday afternoon, Sheriff Jerry Jones was slated to have a primary fight for the Republican nomination with candidates William Mitchell, Thomas Hawley and Rodney Shearin. Horse and other equine animal owners/lessors will vote across the state on March 11 to determine whether to continue to voluntarily assess themselves $2 per ton of commercial horse feed to provide funds to promote the interests of the horse industry. Charles F. Mitchell, Franklin County Extension director, said the vote in Franklin County will take place from 8:30 a.m. to 5 p.m. in the County Extension Center at 103 S. Bickett Boulevard, Louisburg. FRANKLINTON — Town commissioners spent the better part of its most recent meeting debating an issue that wasn’t. During the board’s January retreat, Commissioner Johnny Wayne Mitchell, who is set to open his own downtown business, sparked a discussion about downtown parking. 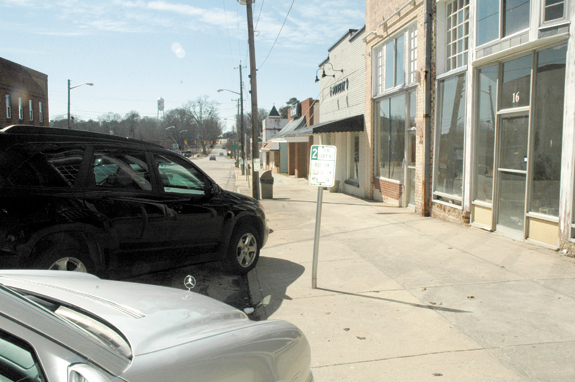 Following that meeting, town staff crafted a letter it sent to downtown merchants, warning them that the Franklinton Police Department would begin, on March 1, strict enforcement of the two-hour parking ordinance.